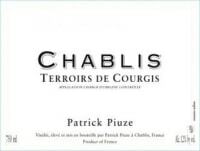 -- Parker: From relatively clay-rich soils, Piuze’s 2012 Chablis Terroir de Courgis displays unusually bright, tart lemon and apple even by vintage standards, yet there is also a surprising suggestion of mid-palate lushness. And while the flavors here are – for now, anyway – quite straightforward and incorporate only hints of chalky or salty Chablis typicity, there is admirable energy and sheer persistence. I’d like to taste this again later this year and suspect there will be more to it then, and that the wine will be worth following through at least 2015. -- -- Galloni: The 2012 Chablis Terroir de Courgis is decidedly cool, inward and precise. A bit reticent for the year, the 2012 is laced with pear, green apple and floral notes, but it is the wine's bright, salivating acidity, along with its underlying structure that stand out most.